Plan your next visit to Aloha Stadium. Be sure to follow us on Facebook or Twitter during game days for the latest updates on gate openings, availability and traffic. Entrance through Parking Gate 1 (Main Salt Lake) – Use Kamehameha Highway or Salt Lake Blvd. Entrance through Parking Gate 2 (North Kamehameha) – Use Kamehameha Highway. Entrance through Parking Gate 3 (Halawa) – Upper and Lower Halawa parking lots only – Use Kahuapaani St. only. Entrance through Parking Gate 4 (Lower Salt Lake) – Upper and Lower Halawa parking lots only – Use Kahuapaani St. only. *During UH games only Entrance through Business Access Gate – Upper Halawa Reserved (PASSES ONLY); Use Salt Lake Blvd. or Kahuapaani St.
Am I able to get a parking pass? Depending on the event, parking passes may be available. Event pages will provide more information if passes are available. Cost of an event pass will vary per client and event. What is required to park in (ADA) accessible parking? Accessible parking spaces are issued on a first come, first served basis. Disability parking during major events will be located in sections 2AB/3B/6A/9A/13A and the Upper Halawa Parking Lot. Disability parking for non-major events may be added to accommodate disabled Guests. Guests must have placard clearly visible at all times -displayed on the rear view mirror or on the front dashboard. Are there Electric Vehicle charging stations? 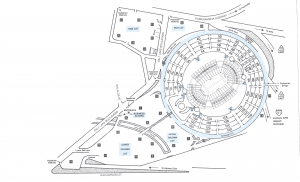 Aloha Stadium is proud to offer two electric car charging stations located in parking section 2A. Use of this station is on a first-come, first-serve basis. Are there specific pick up/drop off areas? Currently share ride services and taxi pick-up and drop-off are available at the main entrance gate for all events. 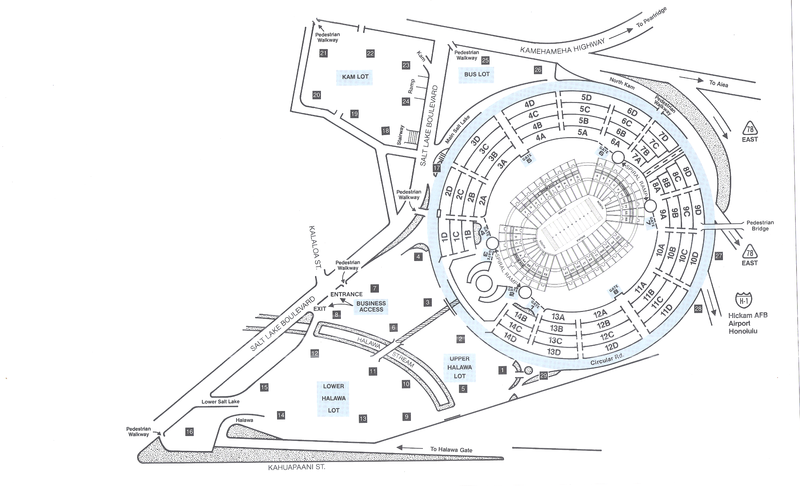 If you must enter the Stadium lot guests must pay the current parking rate of $8.00. Guests must inform the cashier at the time of entry (payment) of the drop off/pick up and request a refund slip (20-minute time limit). Gate opening times vary by event. For UH games, parking in the Upper and Lower Halawa Lots open 5 hours prior to kick-off. All other lots open 4 hours prior to kick-off. The turnstile gates for UH games open 1 ½ hours prior to kick-off. Please check individual event pages for more information prior to the event as times are subject to change. What time do parking gates close? Parking lots close 1 hours after event.